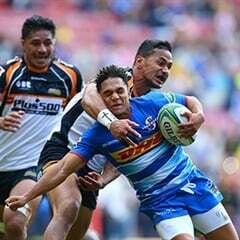 Cape Town - Former Springbok flyhalf Braam van Straaten says he knows why Elton Jantjies has been struggling with his goal-kicking. Jantjies was poor from the tee in Saturday's Super Rugby quarter-final against the Sharks at Ellis Park, and although the Lions eventually won the match with a late Ruan Combrinck penalty, Jantjies missed four kicks that almost cost his side the game. It is not great news for the Springboks, who will in all likelihood be turning to Jantjies to run the show at flyhalf when the Rugby Championship gets underway next month. Van Straaten, who played 21 Tests for the Boks between 1999 and 2001, believes that Jantjies' struggles at the moment are down to technical flaws in his kicking style. Van Straaten says he first noticed the issue in the third Test between the Boks and France at Ellis Park, when Jantjies hit the post with a routine kick at goal. "He gets too close to the ball when he hits his kick and then he leans too far to his right," Van Straaten told Netwerk24. "Two of the main reasons why kickers miss is because they either lean on their toes when they hit the ball or they lean towards one side. "The latter is what Elton does and because he leans too far to his right there is no flow when he hits the ball." The Lions will hope that Jantjies is back to is best for Saturday's Super Rugbysemi-final against the Hurricanes in Johannesburg.